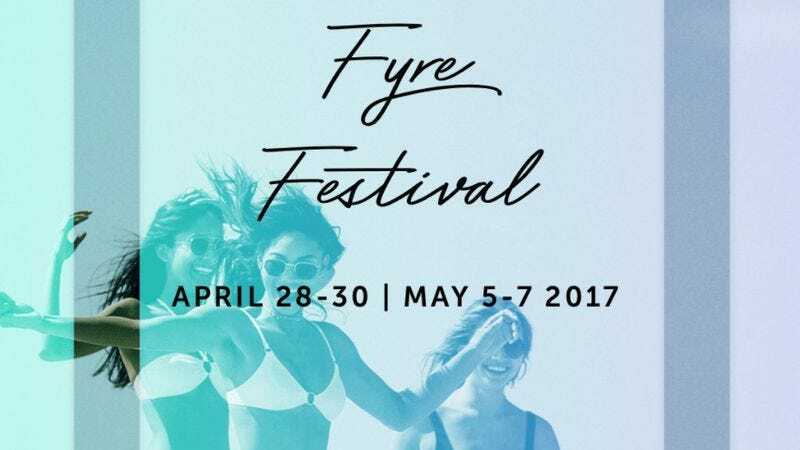 As we speak, wealthy wannabes with cash to burn are being subjected to the horrors of folding chairs and plain cheese sandwiches at Fyre Festival. Pitched as an upscale experience in the Bahamas full of yachts and hot models in bikinis, guests—who paid between $1,000 to $12,000 for tickets alone, and up to $250,000 for yacht packages—instead arrived to find the Spirit Airlines version of a music festival, with repurposed FEMA relief tents standing in for villas, attendees stranded at the airport, and, worst of all, no beer. As word began to spread of the economy-class conditions on Twitter and Reddit, Blink-182 dropped out, and organizers postponed the festival and offered refunds to guests who weren’t able to physically make it to the island. The New York Post takes a more skeptical view, repeating a bit of hearsay that organizers told the A-list models and celebrities hired to promote the festival not to attend this weekend, but to wait until next weekend when “all the kinks are worked out.” It also confirms that Ja Rule did not arrive at the festival last night, as he was performing in Chicago, but that conflicting reports say McFarland was either partying on a yacht Thursday night or on the ground trying to help attendees.